MARC NAGER, CLINT NELSEN, and FRANCK NOUYRIGAT are the Co-Directors of Startup Weekend, a nonprofit with the mission to educate entrepreneurs, strengthen communities, and launch startups. 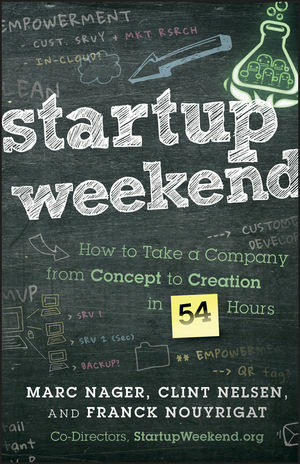 Startup Weekend holds weekend events where developers, designers, marketers, product managers, and startup enthusiasts come together to share ideas, form teams, build products, and create startups in 54 hours. Startup Weekend began in June 2007, and the core team has grown to nine full-time and three part-time employees, along with a network of more than 120 Startup Weekend volunteer facilitators and organizers who plan and lead Startup Weekend events around the world. For more information, please visit www.startupweekend.org.